Senior Olivia Johnson is back from a broken wrist sustained in the Panthers’ final game of the season last fall. From what looked minor from afar was anything but for Olivia Johnson. 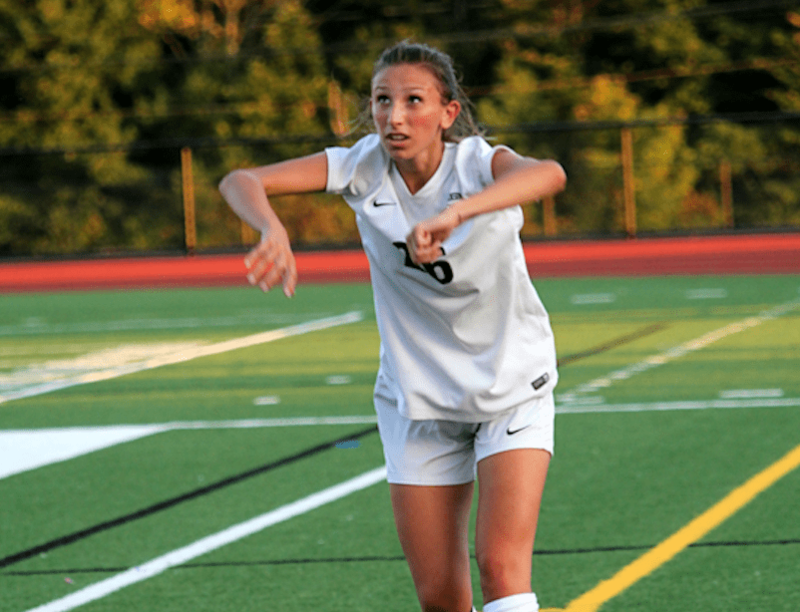 The Whitman-Hanson Regional High girls’ soccer captain was in the wrong place at the wrong time during the Panthers’ Div. 1 South Sectional semifinal tilt against Newton South last season. Roughly midway through the first half, an attack into the W-H zone induced a scrum. Panthers defender Sammy Smith was there to clear the ball and pelted a shot that struck Johnson’s left hand, breaking her wrist in half in the process. Panthers senior goalkeeper Skylar Kuzmich said she remembers the moment Johnson went down. “It was bad and very tough to watch,” Kuzmich said. The injury sidelined Johnson for the remainder of the game – a 2-1 Panthers loss, which ended their season – and put her on the shelf for the beginning of winter sports. “I was actually more concerned about not being able to play in the game and with basketball coming up the next season, just not being able to participate,” Johnson said. Surprisingly, Johnson, who was in a cast for three months on and off, only missed four basketball games. “When I think about it now, if that was my senior year and I couldn’t play in the rest, I’d be devastated,” Johnson said. Well, it wasn’t her senior year, of course, meaning the dual-sport athlete has one more go-around to assure healthy campaigns. The Panthers are going to need her more than ever on the pitch after the graduation of a pair of stalwarts on defense in Betty Blake and Elana Wood. “OJ’s going to be a great leader out on the field this year and I think she’s going to give great direction and talk a lot in the back with me, especially if Sam (Smith) moves up to offense,” Kuzmich said. “I’ve been working on mental toughness on defense, staying fit, staying agile and stuff like that,” she said.